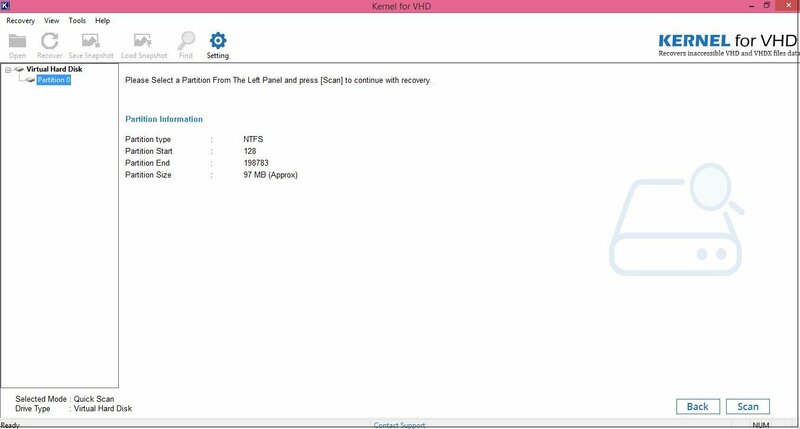 Kernel for VHD Recovery is a professional software that is output-driven. It is highly trusted for repairing and recovering data from corrupt or damaged Virtual Hard Disk files. The software is an advanced, effective, and powerful tool that repairs corrupted, damaged or inaccessible VHD and VHDX files accurately and flawlessly. It is designed with three powerful recovery modes for recovering data from VHD files which are highly corrupted due to several reasons. There are a number of benefits of using this software, that you will know yourself once you use it. Unintentional deletion of data stored on hard disk, and so on. The software uses powerful algorithms for restoring the lost or deleted data and is fast, simple and easy-to-use software. How to Restore Deleted, Damaged and Corrupted VHD/VHDX Files? The user can recover lost VHD and VHDX file data with the help of a third-party tool. 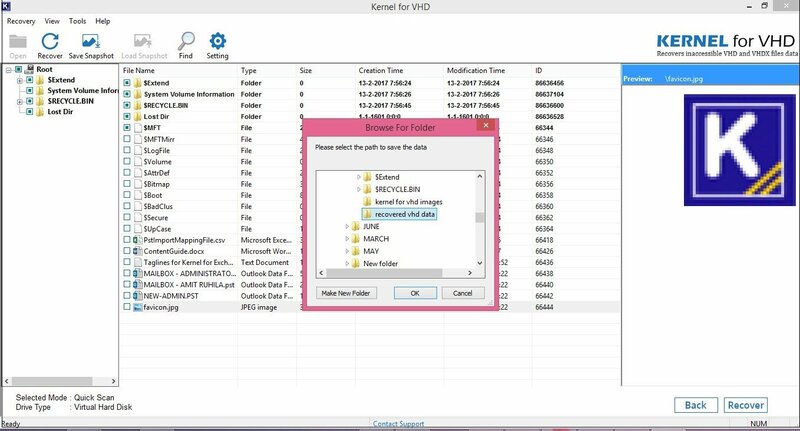 And, Kernel for VHD Recovery tool is one of the best-rated software which is incorporated with powerful algorithms that recover and restore lost, damaged, deleted or inaccessible VHD file data with ease. The tool offers high performance and easy-to-use user-friendly environment. Click Select to browse for the desired VHD/VHDX file for performing recovery. Choose any one from the three scanning modes. Select the drive you want to recover from the list shown in the left pane. After selection of the drive, complete partition information is instantly displayed. Click Scan to continue. One can preview all the recovered files and analyze the recovered data before saving them. Click Recover and choose saving location to save the data. Recovered data is saved successfully to the desired location. Click OK to complete the process. 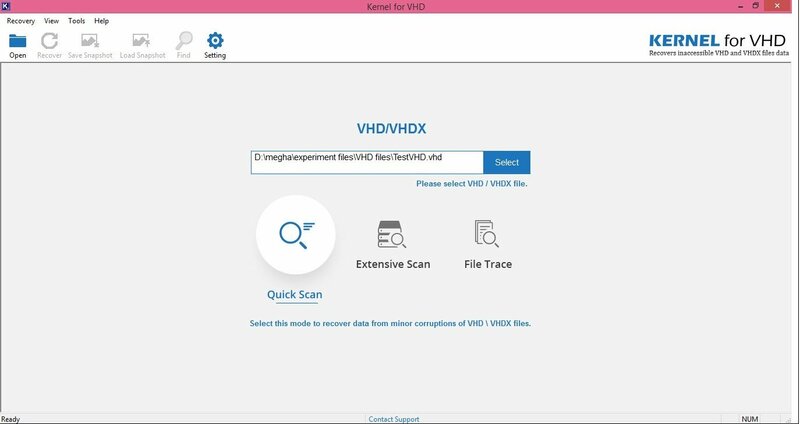 The process of deleted VHD file data is really simple with the VHD recovery tool. All the files are saved by the software in their original format preserving the data integrity, formatting and properties while recovering. 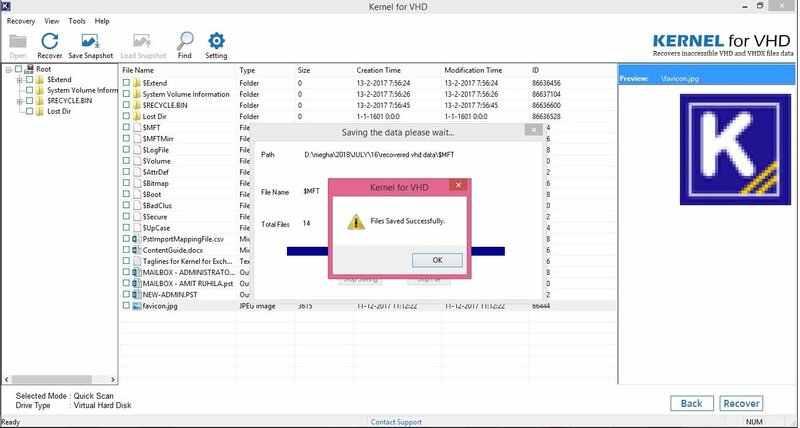 Users can avail the benefits of the Free Evaluation of Kernel VHD Recovery tool if the VHD file is not of large size. They can recover up to 250 MB of data with the help of free version. Also, the evaluation version is similar to the licensed version with few data saving limitation, all the features and recovery modes are the same.